West Seattle Art Walk October 14th! 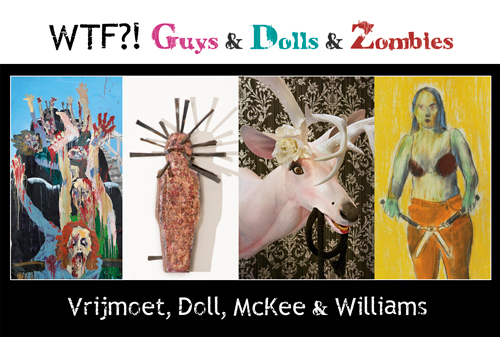 Featured Artists at ArtsWest: From October 5 through November 7 ArtsWest Gallery presents local artists: Kate Vrijmoet, Shaun Doll, Paul D. McKee, and Daniel John Williams in the new gallery exhibition WTF?! 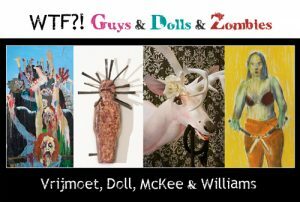 Guys & Dolls & Zombies. WTF?! explores the funny side of fear with adrenaline-seeking zombies, freakish fetish dolls, pretty and pink deer heads with lipstick and ne‘er do wells with knives alongside the theater production of Evil Dead: The Musical. Calling All Zombies! Indulge in some demon-themed drinks and join these artists in a playful poke at fear during the opening reception on October 14th from 6-9pm. This 2nd Thursday Art Walk will be a fun event with haunting hors d’oeuvres provided by Elliot Bay Brew Pub. ArtsWest plans to give out devilish prizes for the “World’s Best Dead” zombie costume contest including a pair of tickets to Evil Dead: The Musical. Eric Pope , leader of the Seattle Zombie Walk, will be judging the contest and announcing the winners DEAD at 8pm!